Hi Uncommon Design readers, My name is Audra, and I currently blog over at Cherished Bliss along with my sister, Ashley. For the past two years I have been the sole voice behind Once a Mom, Always a Cook where my primary focus has always been creating family recipes. At Cherished Bliss, my plan is to continue sharing old family recipes and new favorites that I pick up along the way. We would be delighted for you to stop by and visit anytime! 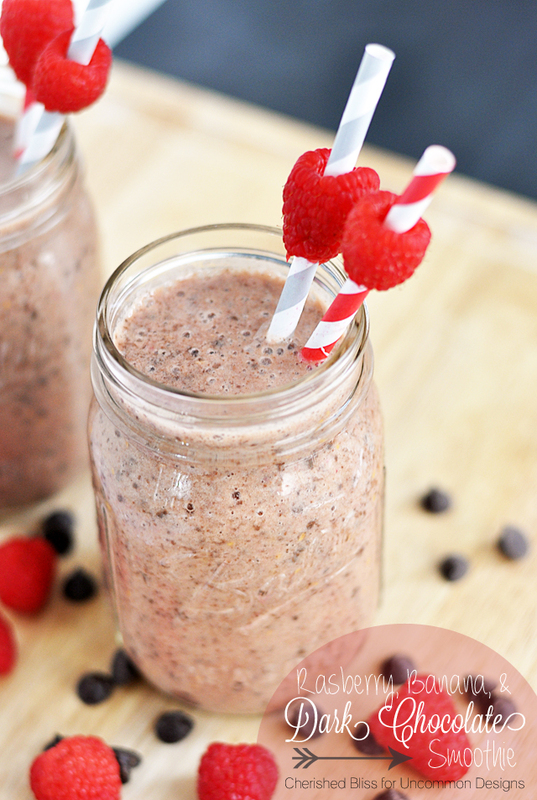 Today I am honored to share a fun recipe for a Raspberry, Banana, and Dark Chocolate Chip Sweetheart Smoothie. This smoothie is a perfect treat for Valentine’s Day! It can be made for a yummy breakfast, an after school treat, or a healthy dessert option. Whatever time of day you choose to indulge in this Sweetheart Smoothie is a great time. Not only is this smoothie fun, but very healthy. Raspberries are a great source of Vitamin K and Magnesium, and is a very good source of Dietary Fiber, Vitamin C, and Manganese. Bananas are a wonderful source of Dietary Fiber, Vitamin C. Bananas are also known for their great source in Potassium and Manganese, and have a great source of Vitamin B6 as well. Dark Chocolate Chocolate has added benefits of a good source of Iron, Copper and Manganese and of course amazing antioxidants. With all the wonderful nutrients of this smoothie I didn’t want to add any refined sugar, so I chose to sweeten this treat with coconut sugar. Coconut Sugar is a nice replacement for white sugar with added benefits. With all types of sugars, refined or not, moderation is always recommend. I know you are ready for the recipe so let’s get started! Place all ingredients in a blender and blend until nice and smooth! Once you have a nice and smooth consistency you are ready to serve your Sweetheart Smoothie to someone special! Garnish with festive straws and fresh raspberries. Enjoy! If you want to check out more of my recipes, this yummy Blueberry Oatmeal Bread Recipe is waiting just for you! Keep in touch with Cherished Bliss! Love the raspberries on the straws!! This inspired me to make a smoothie tonight. I just happened to have fresh raspberries in the frig. I just used ice, milk, raspberries, a little Splenda and some vanilla. It was incredible. Thanks for the post. I love the straws too. Looks yummy but it will have to wait. We broke our blender making a smoothie and I haven;t gone for a new one yet. what could you use instead of coconut sugar? brown sugar?